How do I change the FiLIP wristband? The first step is to remove the end-cap, latch and/or size spacer from the wristband before you pull it off of your FiLIP. 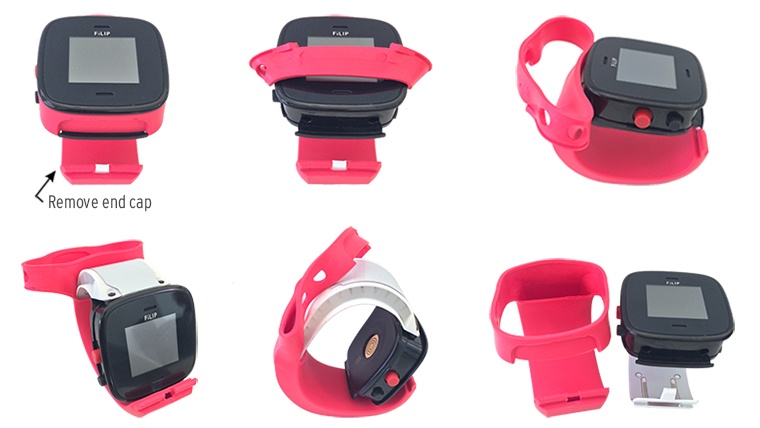 Gently peel the wristband sleeve away from your FiLIP, starting at the screen. Once you’ve peeled the wristband sleeve away from the screen, then the rest should easily slide right off of your FiLIP. Simply slide the new wristband sleeve onto your FiLIP, starting with the thin, flat side and ending with the screen. Once you get to the screen, gently pull the wristband over the screen to secure it in place. Slide your end cap, latch and/or size spacer back on and you’re ready to go. Accessory wristbands are available in Awesome Orange, Limesicle Green, Watermelon Red and Superhero Blue and can be purchased from our website at myfilip.com/shop. How do I use the spacers to change the size of my FiLIP?